Windows 8/8.1 is one of the newer Microsoft Operating systems and it comes built-in with the .NET 4.5 framework. However, there are many 3rd party software programs which still require .NET Framework 3.5 installed on your system. (Such as my personal favorite application SQL Server) In such cases you need to install the .NET Framework 3.5 version in Windows 8/8.1 manually. While adding that feature, I am sure that you will find that errors relate to corrupt or limited access to the source files. But in my experience where I have tried to get around this error, the source has NOT been the issue. 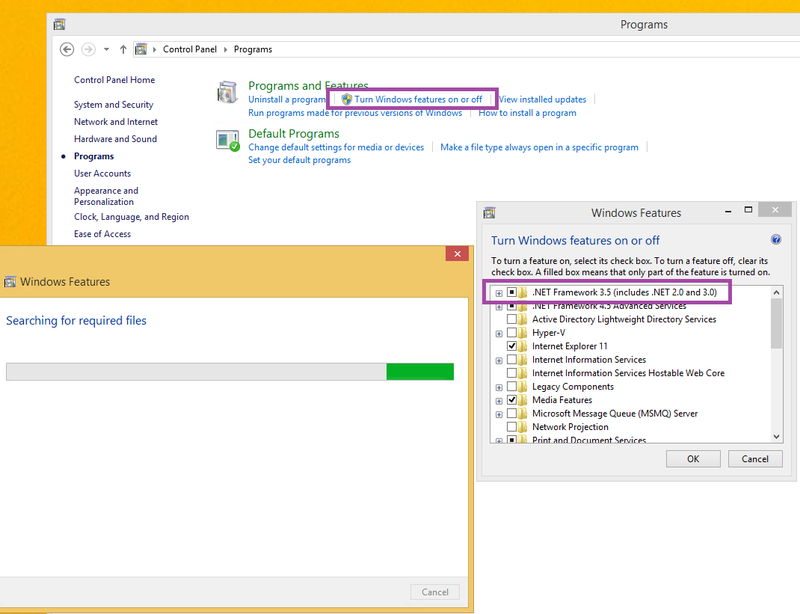 In Online Install method, you install .NET Framework 3.5 using Control Panel -> Programs and Features -> Turn Windows features on or off option. In this method, Windows first downloads the setup files of .NET Framework 3.5 from Internet and then installs it in your computer system. 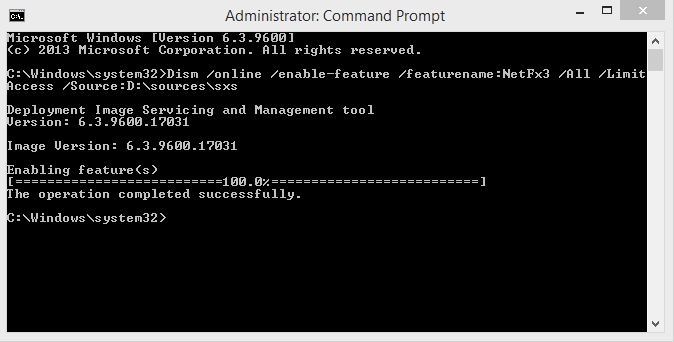 In Offline Install method, you use a built-in command to install .NET Framework 3.5 directly using Windows setup disc without requiring Internet connection as mentioned here. You can also use Microsoft .NET Framework 3.5 Offline Installer to automatically install .NET Framework 3.5 in Windows 8/8.1. Windows couldn’t connect to the Internet to download necessary files. Make sure that you’re connected to the Internet and click “Retry” to try again. However, when both offline and online methods fail, then .NET may have been patched on your machineâ€¦ but wait, you say, it is not installed so how could it be patched? Well that is a good question. If you look at your WINDOWS UPDATES > HISTORY, you may see some .NET 3.5 patches that have been installed. If that is the case go to PROGRAMS AND FEATURES > VIEW INSTALLED UPDATES (from the menu on the top left) and find them by KB number. Additionally, I have found the names of the patches in Windows Update History do NOT always match what is in INSTALLED UPDATESâ€¦ go figure. It doesn’t matter whether you try the online method or offline method, the same error messages and codes are shown by Windows. Above mentioned updates are security updates for .NET Framework 3.5 in Windows 8.1 and Windows Server 2012 R2. 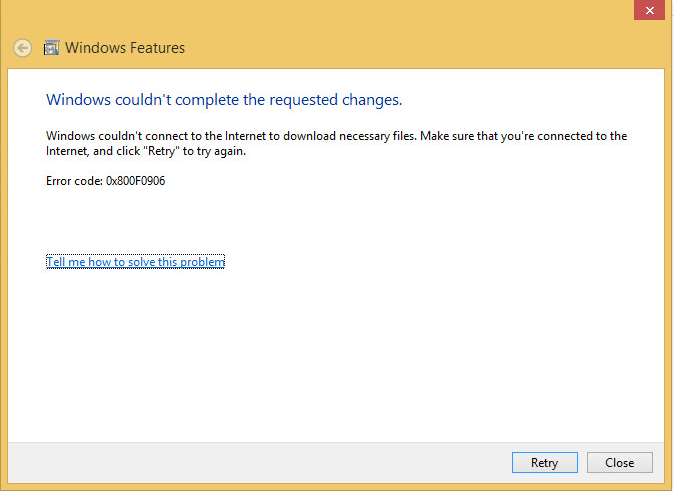 These updates are applied via Windows Update regardless of whether you have .NET Framework 3.5 enabled or not. If these updates are installed in your system and you try to install .NET Framework 3.5, you’ll receive 0x800F0906 and 0x800F081F error messages. To fix this problem, you just need to uninstall these security updates from your system and then install .NET Framework 3.5. After successfully installing Framework version, you can reinstall the security updates without any problem. Open Control Panel, click on Programs and Features icon and then click on View installed updates link present in the left sidebar. Once you find the updates, right-click on each update and select Uninstall option. Alternatively, you can double-click on the updates to directly uninstall them or click on Uninstall button present in the toolbar. After uninstalling the updates, try to install .NET Framework 3.5 again using any method and this time it should install without any problem. 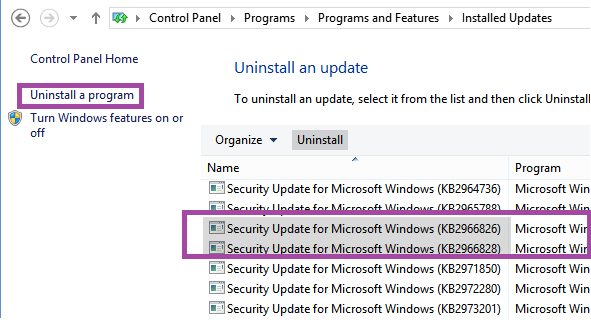 After installing NET Framework 3.5, you can reinstall the security updates using Windows Update.